Attention: All people still suffering and looking for treatment for Trichotillomania / compulsive hair pulling! How she finally overcame Trichotillomania! Benefit from first hand practical experience! Learn from lessons that already helped someone overcome Trichotillomania and can help you too! Shorten the time span for overcoming Trichotillomania yourself! Become inspired for a better quality of life! Have you ever wondered if Trichotillomania is something you can actually overcome and what it takes to do so? Believe me, having helped many people to overcome Trichotillomania, I can certainly relate that this is an important question to positively answer for yourself for moving ahead. But instead of taking just my word that you too can learn to overcome the urge for pulling out your hair, I invite you to listen to a brave lady who is willing to share – completely open – how she already achieved this and how you can too. Someone who overcame Trichotillomania quite quickly (in only 5 hours) after more than 9 years of struggle on her own and well-intended advice and support of others that failed to deliver. So you can benefit from her successful experience, become inspired for a better quality of life and shorten the time span for healing yourself. Which is exactly what the recording you can purchase below is meant for! Can you really overcome Trichotillomania and what does it take to do so? A lot of people I helped overcome Trichotillomania got confused before I helped them if this hair pulling habit is something you can actually overcome and what it takes to do so? Something I perfectly understand, because there are a lot of conflicting messages about this topic, so who should you believe? Maybe you too have already tried many things that did not work or maybe you were influenced by the beliefs or opinions of others that did not really help you to move forward. You see, everyone I have helped over the years went through a similar process. Fighting with themselves (often in shame) trying to deal with this behaviour and not really knowing if and how to overcome this. Frustration builds up without any breakthrough results. Now one of the things that really helped me to grow in areas of my life is to listen to people who already achieved what I was after. Because a person can only come from his own experience in life! So if you listen to someone who still struggles with Trichotillomania, that person cannot teach you how to overcome it. Initially it might be nice to surround yourself with such people who recognize what you deal with, but in the long term it seldom helps you grow and achieve what you are after. This simple process of learning from Experts who already achieved what you are after in life is something that is heard of by many, but practised in real life by a lot less! So how wonderful would it be to comfortably listen in the privacy of your own place to someone who already overcame Trichotillomania and someone who has assisted many to do so? And learn from THEIR insights. That will very likely help you to move ahead in the right direction too! Makes sense, right! Now this concept of course sounds wonderful, but the challenge with behaviour like Trichotillomania still is that it is seldom discussed out in the open. Those who have learned to overcome it often want to move on and leave it far behind them. And those who still struggle with it can only come from their own experience, which sometimes happens in on-line discussion forums. So how do you find Real Experts in this area and surround yourself with them, so you can benefit from that experience? That is exactly why this recording was created. And although I am personally proud that I can offer it to you now, I am also very grateful for the person who allowed me to interview her. 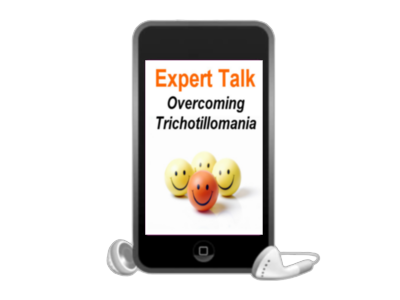 Because as a result of her braveness to openly discuss this topic in this recording for the very first time, you can benefit from these insights if Trichotillomania is something you are still fighting with in your own life! Fortunately this brave young woman you are about to listen to found a way out and learned how to overcome Trichotillomania when we started working together. Now she already showed her braveness when she had the courage to admit to people around her that she suffered from compulsive hair puling and could not solve it on her own. So she came out in the open and through support of others asked me to help her. But when I asked her if she was willing to share her most important lessons learned after she overcame it, again she showed her braveness by saying YES, realizing how many others that are still suffering from Trichotillomania in their lives can benefit from this valuable information! Now before you scroll down to the bottom for ordering this recording, I think it is wise to also get some more background info from myself in this field. Because it is not just her insights that are shared on this recording, but also my own experience in this field through the questions that I asked her to reflect on. Long time ago I realized that training and managing your own mind is the most important skill you could ever own in terms of both happiness and success. So, over time, I have really poured my heart and soul into learning everything I could about how we do behaviour as human beings. Because it is by how we think that decides how we feel, what we do and what we will achieve. In that order only (think, feel, act, result), never the other way around :). So the mental part of everything we do and accomplish plays a VERY important role. For years I ate, slept, and drank this world of human behaviour and especially the mental part of it. As a direct result of being immersed in it for many years and actively having helped many clients overcome behaviour challenges that were previously thought of as impossible, I’m now considered an expert in this field. So as a Mental Coach & Trainer I help people on a result oriented basis to take better control over the mental part that is driving their behaviour and improve the quality of their life as a result. Now the funny thing about your behaviour is that it is initiated at two levels of your mind. First there the level is the conscious mind. That’s the level where you consciously tell yourself to stop with pulling out your hair, and unfortunately that simply does not work with something like Trichotillomania. Because when the urge to pull out your hair is strong enough, you simply do it! So there is a second part of your mind where the habit of pulling out your hair resides, which is always the far stronger part. Otherwise you would already have left Trichotillomania far behind you. That second part of your mind is called the unconscious, and how strange it may sound, it truly has the best intentions for you. Now you might say: ´What is so good about this habit of pulling out my hair?´ But at this stage I simply want you to trust yourself that deep down inside this behaviour is also serving you somehow. The way it is serving you is called the positive intent of this behaviour. Let me clarify this a little more with an alternative type of behaviour that we consider to be quite normal in society, smoking. To some extent that type of behaviour has the same kind of ´addictive out of control characteristics´ as compulsive hair pulling behaviour. So someone who smokes and no longer wants to do it might tell him or herself to stop, but simple keeps smoking when the urge is strong enough. Same with hair pulling! But every time the smoker smokes, she might get something positive out the negative habit. For example a feeling of relaxation at that instant. Could be possible, right? Call that feeling of relaxation the positive intent of the smoking behaviour, which unfortunately is also limiting that person in other areas of her life at the same time, i.e. health wise. The same is true for a compulsive hair puller! Somewhere inside you serve yourself with pulling out your hair and at the same time limit yourself in other areas of your life through the shame that is often involved and the way this behaviour impacts your freedom. In the success stories on this website that I was allowed to share by some customers you can read many examples how Trichotillomania negatively impacts the quality of life. When I read stories like these, it breaks my heart, because I know that this behaviour can definitely be overcome! And there have been many instances where people knocked on my door with similar cries for help that I had to honour. I simply had to because I knew how to overcome this behaviour and could learn them too! Over time having worked with many people to overcome Trichotillomania it becomes rather difficult to ignore that all of them apparently share something in common! A common denominator that plays into the life´s of all that suffer from this and is at cause for pulling out their hair. So I was able to develop a unique approach that is very effective for helping people overcome Trichotillomania. For more extensive information about my professional background, relevant education, and how I got involved in helping people to get over Trichotillomania, I kindly refer you to the ‘about page’ on this website. But also to reflect on your own on the way I work with people in helping them towards freedom from this behavior. With a 100 % satisfaction guarantee. Because I can hang all the diplomas on a wall for decoration, and they really look nice and impressive, but I personally am more an advocate of both a very good professional background AND wonderful results for the people who ask me to help them, and I hope you too! Over the last few years, a lot of people who are aware of what I do to help people overcome Trichotillomania constantly hassled, encouraged, and cajoled me to make an audio recording about what it truly takes to overcome Trichotillomania with someone I already helped before. So people who are still struggling in shame with Trichotillomania in their life, or maybe have given up hope, can benefit from this recoding in the privacy and comfort of their own place without having to come out in the open with this! So they can easily become inspired for a better quality of life when they directly listen to someone who already overcame this hair pulling habit and learn what it took for this person to achieve this wonderful result. And through these insights hopefully can shorten the time span for healing themselves. So I finally gave in and decided to put in all the work that came with it for people like you to find this on the internet. Which was a lot of hard work I can assure you! But when something comes from your heart, it becomes a lot easier and inspiring. So now I am ready to share it here with you. And by listening you will soon discover the simple, yet powerful, lessons learned by someone who already overcame Trichotillomania after years of struggle on her own. So it is REAL LIFE EXPERIENCE you are about to listen to for what it TRULY takes to overcome Trichotillomania once and for all. Directly from the ‘horse´s mouth’. From someone who already overcame Trichotillomania and someone who has helped many to accomplish this. The recording itself is just over thirty minutes because there’s no fluff or filler, it’s packed with practical insights you can use instantly. A few people that have already had privileged access to the recording told me that the information being shared in the recording is worth hundreds of euros or even more. Because how valuable is it to get some quality information that already helped someone else and can help you too towards the road of freedom and a better quality of life. A life free from Trichotillomania. Now I admit, it’s not a recording for which we officially went to an expensive recording studio where we had to hire all kinds of people. We actually recorded it ourselves in my own coaching practise with a digital audio recorder and added some nice music to the background 🙂 with audio editing software bought over the internet. But with the technology available today for all of us, you will probably not notice a real difference from recordings made in an expensive recording studio. And if you want to be impressed with eloquent or fancy recordings, this probably ain’t the recording for you. But if you’re looking for practical real life advice and insights you can rely on from someone who already achieved what you are after, this recording can definitely help you too! 🙂 Benefits for overcoming Trichotillomania, how your life improves afterwards. If you’ve read this far, you’re probably asking yourself if my Recording will work for you, right? Here’s the thing: I promise that all of the insights revealed in this very special recording will not only inspire you for a better quality of life for yourself too, but will assist in shortening your time span for healing when applied properly into your own life. But for any reason you’re not completely satisfied with the results, let me know and I’ll give you 200 % of your money back! As you can see, besides my desire for truly wanting to help you when you still struggle with this in your life, it is my unique experience in this field which is now combined for the very first time with the very personal experience of someone who went through the process of overcoming Trichotillomania herself. I don’t believe this has been done before, so with all of my heart I am now offering it to you. So wherever you are, whoever you are, whatever you believed before or how long you have already been pulling out your hair, you can truly benefit from this recording! Listen to it and then take action by giving me your feedback about how it helped you on my blog at treatmentfortrichotillomania.com That’s all I ask. I want your honest opinion because it’ll help me make further changes to enhance the Recording for future readers, who’ll be paying full price! Stephany - About learning to overcome this behavior: If I can do it, you can do it! It's a very good thing - it is worth it. It is worth the effort! Which actually is not really that much of an effort at all. Rik has an approach that is sincere and to the point. I had expected that it would be difficult but it was very easy. P.P.S. The worst thing you can do now is nothing. You’ll be no further, and your time reading this page will have been wasted. Don’t give into fear of the unknown. Come from a place of inner strength instead by doing the best FOR YOU. Invest 1€ and get back hundreds of euros as a result of the expertise I’m sharing with you in this recording. It can put you on the road towards freedom too, I promise! So let’s wrap this up now … click the “Buy Now” button below … do it!